As an ecommerce retailer, you know that customers return products. It’s just a fact of life. But when almost half of them make those returns because the product they ended up with didn’t match the description you gave them, there’s an obvious opportunity for improvement. And that improvement won’t only pay off in the warm and fuzzies you’ll get after creating a better customer experience because, right now, poor product information management (PIM) is costing you big time. The global management consultants at A.T. Kearney found that poorly maintained product information causes companies to lose about 3.5 percent of their sales each year. In addition, someone on your team is spending 25 minutes per SKU, per year just manually keeping product information up to date. That’s costing you up to $400 for every invoice that needs to be reconciled—which unfortunately includes about half of your invoices if you aren’t using PIM. However, companies that implement PIM software can reduce time to market by up to 400 percent, increase sales up to 50 percent, experience as many as 23 percent fewer returns, and drop customer inquiries by 27 percent. Not only does this boost in sales and reduction in returns have an immediate impact on your revenue, just imagine what effective PIM could mean for labor productivity, new product and partnership opportunities, and customer loyalty. More and more companies are flocking to PIM to differentiate themselves as consumers take their shopping online. And they trust PIM solutions to empower them to create, enrich, govern, and deliver high-quality product content with cloud technology, smart automation, rapid time-to-value, and enterprise-level scalability. This guide is for online brands and retailers who are ready to take the plunge into PIM software. And in it, we’ll do our best to help you understand why PIM matters, how it can benefit you, what features to look for and questions to ask when you’re shopping PIM software, and how to choose between some of the top PIM providers. Whether you choose to invest in Plytix’s user-friendly and affordable PIM software or one of the other options on the market—we’re always on call to help you unlock the power of your products. Product information management is the practice of collecting, centralizing, refining, maintaining, and distributing all the consumer-facing information and data needed to successfully market and sell products. If you haven’t heard of PIM, it’s likely you’ve at least heard of a similar practice like master data management (MDM), product lifecycle management (PLM), or product resource management (PRM). 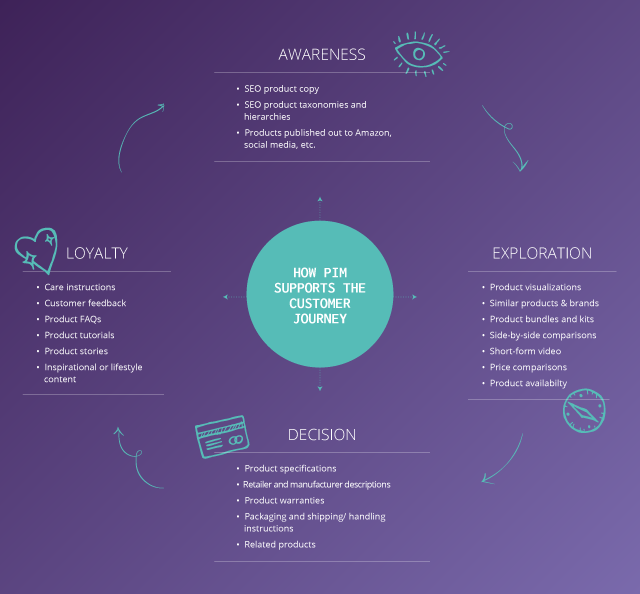 While it’s not important what your organization calls it, it is important that you have a PIM system in place if you’re trying to make it in today’s digital retail market. In fact, Forrester says digital businesses are now attaching as many as 200 attributes to every single product. In what the report calls a “content arms race,” the winner will be the one who can keep millions of attributes fresh, unique, and accurate across dozens of advertising platforms, websites, catalogs, and more. PIM software empowers retailers to make ecommerce easier by providing a single source of truth from which their entire team can collect always-accurate product information and assets to enrich and optimize distribution across sales and marketing channels. PIM software may store almost any information pertaining to a product, including the description, pricing, configuration, shipping, logistics, taxation, reviews, and more. 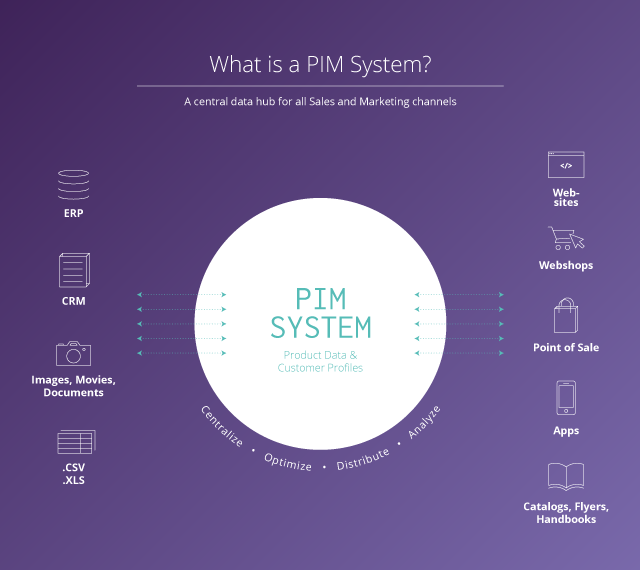 And good PIM software (which we’ll dive into later) can help your team organize product information in nearly endless configurations to provide a better experience for marketers, merchants, and customers. Why Do I Need a PIM System? There’s no doubt that today’s retailers need a digital way to organize their product information. That’s because, without it, marketing people, salespeople, and any other people involved in keeping consumer-facing product info up to date spend way too much time manually updating hundreds (or thousands) of product descriptions across dozens of platforms—all while hoping the info in the “2018_products_Ron’s edit_FINAL V3_REALLY THIS IS THE FINAL_Leslie’s changes X2” spreadsheet is actually up to date. Manual, time-consuming practices like this make it impossible for online brands and retailers to keep up with the growing demands of ecommerce. Speaking of growing demands, 64 percent of adults in the US shop online because there’s more product information than what’s in store. Not only does that mean more competitors and more products are coming online every day, it also means shoppers are expecting you to step your game up when it comes to the variety of products you stock and how accurately you’re able to describe each. How Will I Benefit from Using PIM Software? Essential product data: SKUs, UPCs, names, titles, descriptions, etc. Taxonomy and relationships: categories, labels, variations, etc. Technical specs: measurements, materials, ingredients, warranties, etc. Digital assets: images, videos, documents, etc. Marketing data: keywords, personas, SEO elements, etc. Sales info: prices, testimonials, customer reviews, etc. Design specs: style sheets, designer notes, assembly instructions, etc. Channel-specific info: Google categories, Amazon titles, mobile descriptions, etc. Localized info: multilingual copy, translations, etc. Production data: supplier, manufacturer, etc. The biggest issue online retailers face is keeping all of this data intact across multiple channels with both accuracy and efficiency. Manual systems and out-of-date, over-built product management tools only allow you to achieve one or the other—accuracy or efficiency. A modern, user-friendly PIM solution should have only what you need to streamline product information management so your team can ramp up their productivity, impress customers with awesome data quality, and take back their time to do some of that marketing and sales they were actually hired to do. Plus, it should be able to interact easily with other systems to serve as an accurate repository where you can easily send internal and external stakeholders to find the latest product info. The benefits don’t stop at what PIM can do—here’s who on your team can benefit! Easy-to-use PIM software gives sales teams accurate product data and materials they can access on the go. Ecommerce managers are able to keep products up to date to improve conversion rates while customer support representatives can access information with ease to ensure accurate service. Marketing teams will have one less thing to juggle and, perhaps best of all, your customers will be empowered to buy with confidence knowing your brand continues to provide quality information (and products!) they can rely on. In order for your PIM project to have a successful impact on your business, you can’t just invest in the technology without asking the right questions to ensure it aligns with your goals and processes. Ask these questions to define what you want from a PIM solution, what good product management looks like to you, and what your team will need to do to make the most of PIM. 1. What do I want my PIM system to achieve? 2. Is the PIM system on-site or on the cloud? On-premise PIM systems have to be hosted on your own computer or server—a requirement that smaller organizations without a well-rounded IT team might not be able to meet. Cloud-based PIM offered as software as a service (SaaS) is centrally hosted and can be accessed on demand via a browser. 3. Does the PIM system come with standard or customizable exports? Standard exports are connections with distribution channels that help map your product data according to their specifications. If your company uses unique naming conventions and fields, you might want to seek out a PIM system that allows you to customize these exports. Customizable exports offer a little more flexibility and control. They allow your PIM system to adapt your data naming and formatting while still successfully exporting product data to different channels. 4. Will the PIM system allow me to upload and manage digital assets? If you want to be able to keep data and images linked to the right product, choose a PIM system that comes with asset management. This will be especially important when media-heavy product descriptions are key to winning conversions. 5. What types of support packages are offered with this PIM tool? Support levels can range from a DIY knowledge base to responsive live support. If you’re new to PIM software—and especially if you’re new to PIM practices altogether—be sure to choose the level of support you’ll need during the setup and maintenance of your tool. 6. Where do I publish and distribute product data? The more channels, formats, and languages in which you need to publish your content—the greater the case for a PIM system that’s easy for your whole team to use. Be sure when choosing that it’s capable of handling apps, catalogs, email marketing, and any other channels upon which you wish to distribute. 7. Where do I get product data from? Kind of like the last question, you want to take stock of all the sources from which your data comes. This will help ensure the PIM system you choose is capable of handling all your sources without causing your team to have to do a bunch of manual data rewriting and entry. 8. How complex is my product information? It’s not about the number of products—many PIM systems can handle a ton of those—it’s about how complex the data around them is. Do your products need a lot of information? Is the structure of that information important to maintain? Are the products highly configurable? The more complex your product info, the more careful you should be that the PIM system you choose allows your team to manage it efficiently. 9. What workflows does PIM need to support and what processes can I develop to maximize its success? Now that you have a tool that can actually handle a product content production and distribution workflow, it’s time to take a look at the way you’ve been doing things to determine what needs to change and what processes can be adapted to make the most of your new PIM system. Who should interact with product information? How should they be able to do it? When should they be able to do it? 10. How closely does my PIM system need to integrate with my ERP? Should a product’s lifecycle start in ERP or in PIM? Should ERP data (prices, inventory status, etc.) be visible in your PIM system? Do you need to be able to maintain PIM data in ERP without opening your PIM tool? Do you need to generate data sheets, or similar outputs, in ERP? What Features Should I Look for in a PIM System? There are as many different PIM features as there are PIM software providers—many of whom take advantage of this fact by offering different prices for different feature sets. For a simpler way to launch products faster, establish cross-channel coherence, create rich content, manage a range of digital assets, and overall master your product content—all with straightforward pricing and unlimited users and data—try Plytix. Which Top PIM Provider is Right for Me? Online retailers come in many shapes and sizes. Unfortunately, most of the top PIM software comes in one shape and size—very large and very expensive. 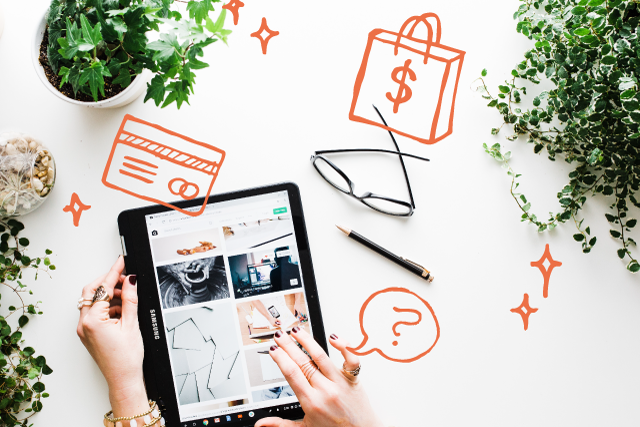 As more modern online brands and retailers break into the ecommerce game, feature-heavy PIM software with complicated workflows and expensive add-ons is becoming a thing of the past. You want something that’s flexible and easy to use, easy to learn, and easy to add team members to as your business grows. 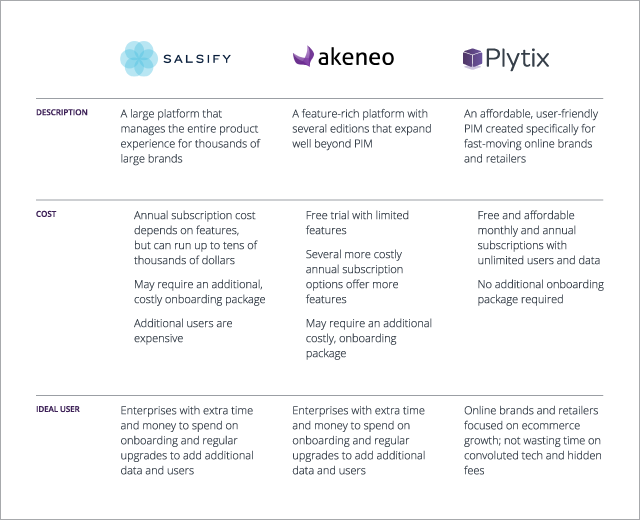 To help you choose the PIM solution that makes the most sense for your ecommerce business, we put together a comparison of the three top PIM systems: Salsify, Akeneo, and Plytix. Salsify is a PIM and DAM platform that centralizes product information like images, videos, and more to deliver customer experience across a variety of channels. The Salsify ecosystem provides analytics on content performance and is available through custom-priced packages based on the required capabilities. Akeneo is a highly extensible and customizable open source PIM system designed for retailers using multiple channels. It comes with an import engine to streamline data onboarding from virtually any source and utilizes a product grid to put info in order while helping you execute advanced catalog searches. Define data attributes, complete product sheets, translate your information, add media files, and keep track of modifications with Akeneo. Plytix is a ready-to-use product content hub to help online brands and retailers manage, optimize, and distribute product content from one cloud platform to get to market faster. Simple enough for compact teams and powerful enough to support limitless growth, Plytix gives your product assets a single place of reference in the cloud so your entire team can organize and distribute product data to multiple channels. Link unlimited images, videos, PDFs, and other files to products without duplicate content. Plytix is built specifically for online brands and retailers and features affordable monthly and annual pricing with unlimited users and data. It takes an average of four weeks for an online retailer to manually get a new product fully onboarded. That’s four weeks your sales team can’t be selling. Four weeks your creative marketing team will spend hating the low-skill, manual data entry and convoluted communication it takes to get the product to market. Four weeks in which your customers can start shopping for that product from your competitor. On the flip side, worthwhile PIM software will get new products up and running within a single week. Whether you’re the do-it-all CEO or a forward-thinking marketing, sales, or IT professional who just knows it’s time for your brand or retail shop to adopt PIM software so you can beat your competitors to market, spend less time pushing paper, and start distributing quality product data that converts—we hope you’ll try out Plytix. Our subscription plans are affordable and flexible and your unlimited users will love the easy workflow. Watch a demo, book a consultation, or sign up to get started today!